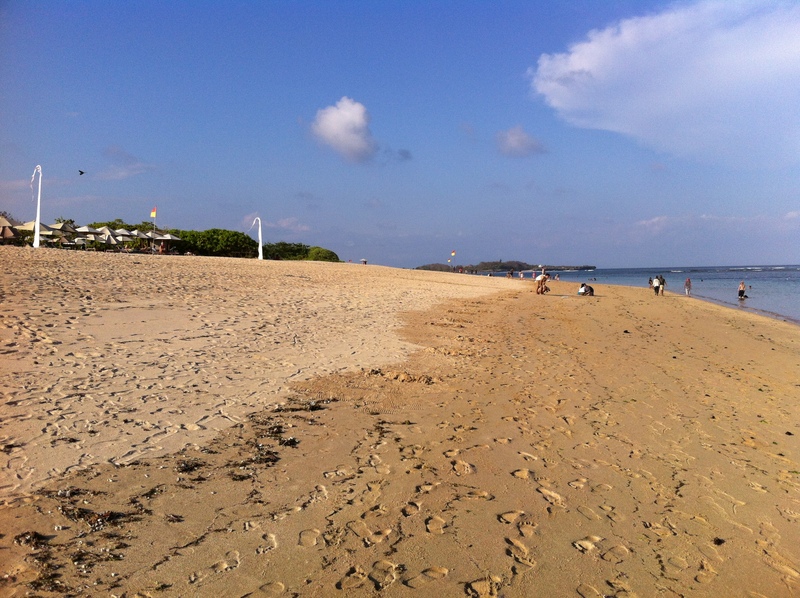 When I flew to Bali, I expected a paradise would await me, but the visit was a complete disappointment. 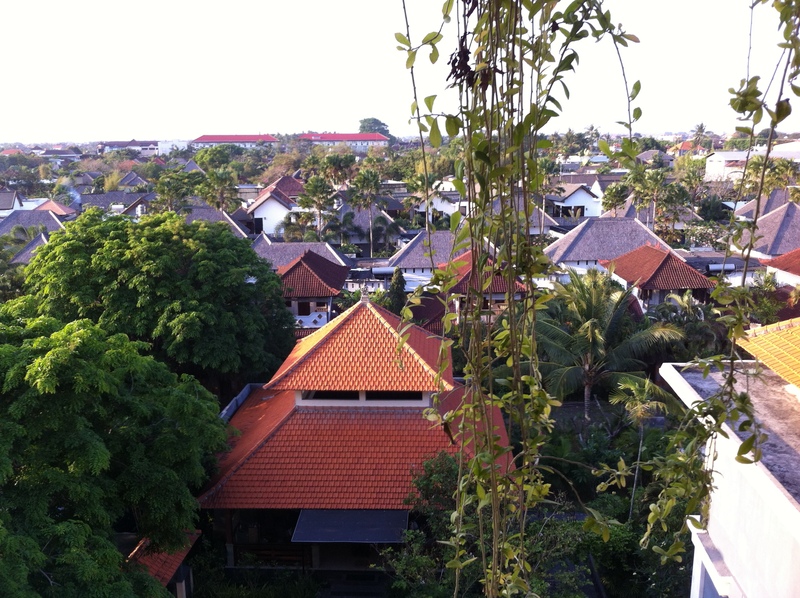 From Ubud, we chose to go to Nusa Dua, just as unknown to us as Ubud had been, but with the advantage, from my irrational, malaria-phobic point of view, of being on the ocean, away from the jungle and the rice paddies. 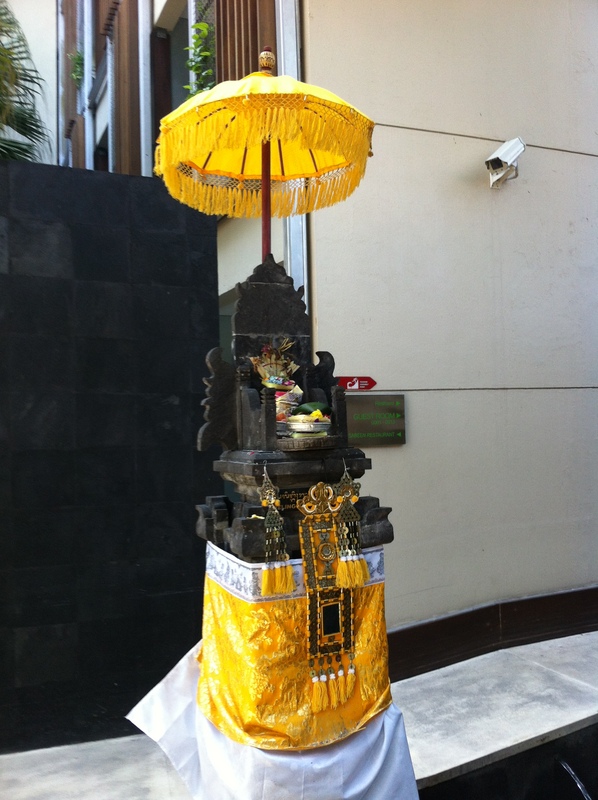 To get to Nusa Dua, as to anywhere else, one must take a taxi or hire a car. There is little to no accessible public transportation, and distances are deceptively long. Funny thing, though, whenever we asked someone in Bali how long it takes to get from one place to another, the standard answer was “Maybe 45 minutes.” We learned quickly that 45 minutes was a rough estimate that could mean anywhere from a hal-hour to a whole day. From Ubud to Nusa Dua, “45 minutes” meant a two-hour trip, spent mostly in kind of slinking rather than moving slowly behind buzzing armies of motorbikes. 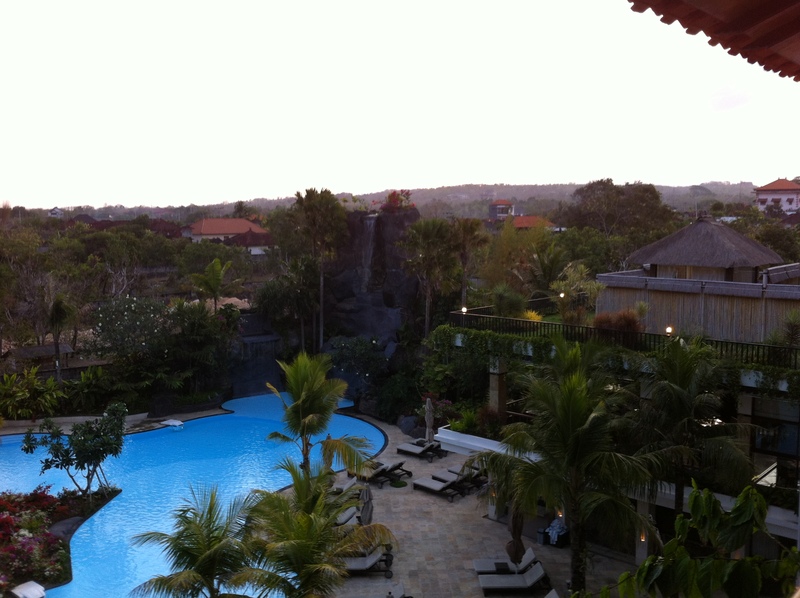 Nusa Dua is a construction site. There are a few lovely resorts, but there are far more works in progress. In a few years, the place will be more developed than Miami Beach, but for now, it’s evolving. 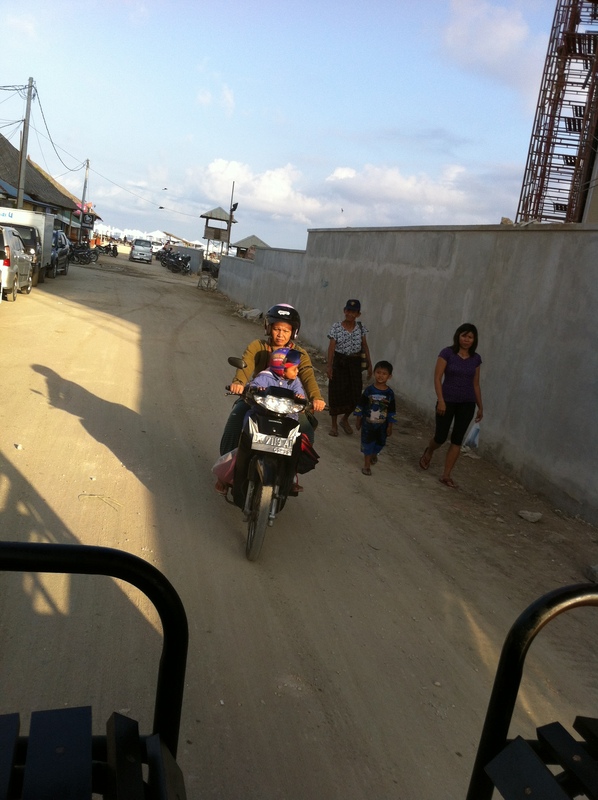 Hordes of workers on motorbikes murmur in in the morning and out in the afternoon; the hotel we stayed in provides a shuttle to both the beach and the local mall that serves as a town center. The beach is close enough to walk to, but the road is not nearly safe enough to try that. The hotel we chose was the Swiss Belhotel, only open a year and already showing signs of wear in the rooms, which are constructed of inferior quality products. However, the ambience was delightful, and the food at the breakfast service was wonderful. The grounds, however, make the place downright regal. The pool, or rather the two pools, one with a waterfall and vegetation that would have startled Eve with its splendor, were magnificent! The grounds were so lovingly nurtured that I counted eight distinct colors of the bougainvillea that flaunts its beauty everywhere. Birds of Paradise, Frangipani, Jasmine and Kasia dance in the breezes, singing lullabys to the myriad orchids that punctuate the space. To complete the idyll, just next door to the hotel is a small farm with the miniature cows that wander the hills here, and roosters strutted even the hotel grounds, promising to wake us first thing in the a.m.
As we had learned to expect, the Swiss Belhotel was staffed by overzealous servers, every one of them falling over themselves to give us what they imagined we might want, forcing on us what we weren’t sure of. I tried to take a cup of coffee out of the breakfast room, but I was stopped by a young woman, who insisted that she carry it for me; she couldn’t even hand it back to me at the door but had to carry it in to place it upon the desk for me. The mall was fascinating. Called The Bali Collection, the mall is a kind of Carribean-styled area with lots of shopping and dozens of restaurants, each with hawkers out front beckoning visitors in. We were there during off-season, so many of the restaurants were empty. That didn’t stop the live music. At least three restaurants had bands playing ridiculously bad covers of pop ’80’s and ’90’s to empty establishments. Completely empty. One evening we chose a restaurant for dinner thinking we’d get some good fish. We didn’t. But we did get a “free cocktail,” a thimble-sized cup bearing a sweet, pineapple-y concoction. When we didn’t raise our glasses fast enough for the waiter to feel he had done his duty, he took my hand and folded it around the cup to help me raise it to my mouth. It took every ounce of energy to constrain myself here. I am, after all, a New Yorker. Enuf sed. 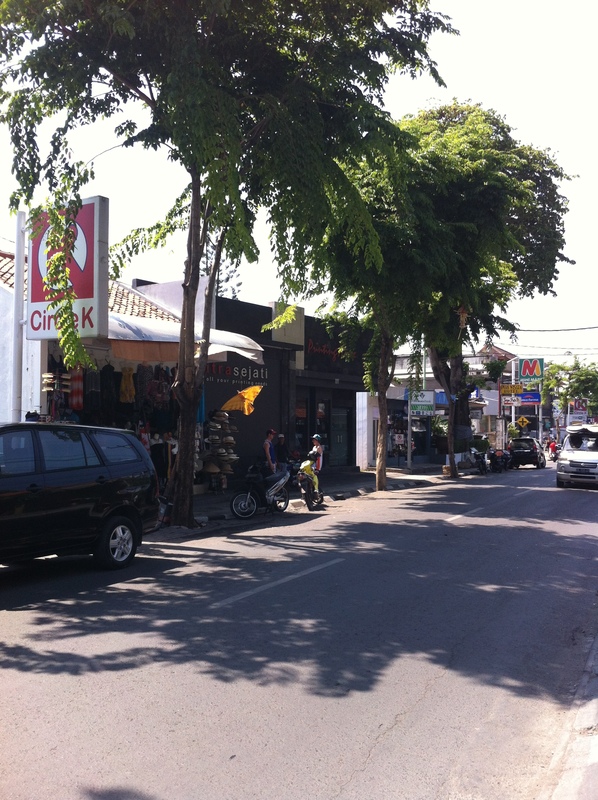 From Nua Dusa we went to Seminyak, a bustling, over-populated tourist throng. This time we endured a comedy of language error that I will be laughing about for years. A manager arrived to assist. His English was great. I told him we just wanted to see something that was not facing this infinite revelry. He said that he had space in the Studio, but it will cost more. Well, it turns out that more is a mere $10 US added to a rate of $60/night (I booked the room through Agoda.com), and I said that if the place were quiet, it would be well worth it. So began a comedy of errant room searching. The first room he took us to was right above the one we had booked. Not in another part of the hotel. He couldn’t get the room open — natch; he did not have a key for that room — and no one answered, so we left. We kept trying to explain that we were in the wrong wing, but he simply kept nodding. We went to another room in the same wing. This time a very disgruntled Russian came to the door. Inside, his girlfriend moaned her displeasure. Our boy was very embarrassed. Now he thought to ask someone. After a deep conversation, he turned to us, bowed and indicated we should follow him. We did — across the wide expanse of the hotel, up stairs, down stairs, into an elevator, up to the forth floor; and then we were transported to another world. Quiet, staid, dignified, the Studio is actually another hotel altogether. There are villas here and duplex one-and two-bedroom units as well as what they call studios, rooms with an alcove for sitting and working. The room he showed us was a deluxe. Bigger than the original room, it faced a pristine, quiet, inviting pool, and it even featured, on the balcony, a cushioned couch-style seat. We said we would take it. He led us out again and, over our protests that we were supposed to stay in this wing, he led us back to the original desk. At this point, the clerk explained to me that our bellperson is not only very new, but he comes from an area where they speak a local language, and he is still learning Indonesian. In any case, we settled into the lovely room, then walked (WALKED) to a beach that for all the world could have been Venice Beach, CA, and then went in search of a place to dine. 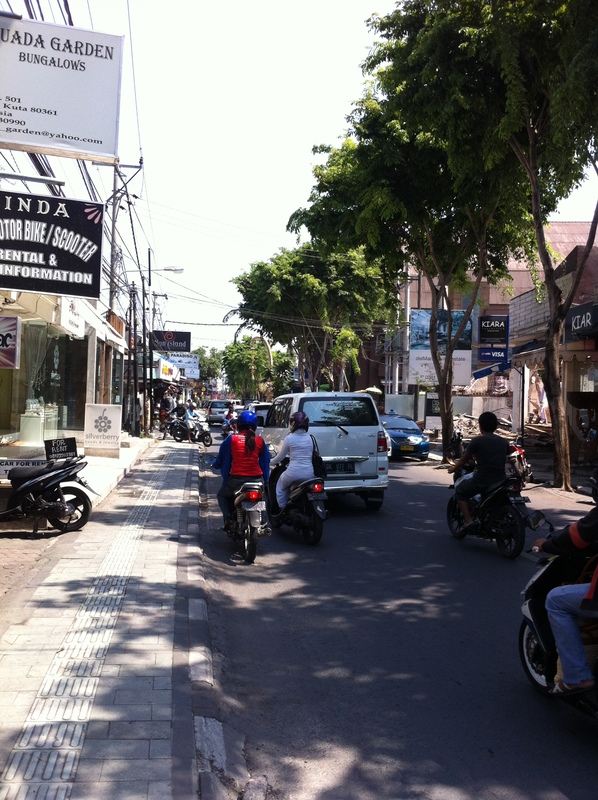 Walking in Seminyak is almost as challenging as it is in Ubud. Troops of motorbikes, like so many buzzing drones exiting an apiary, congregate everywhere in clumps, maneuvering en masse among the suvs and trucks on the street. 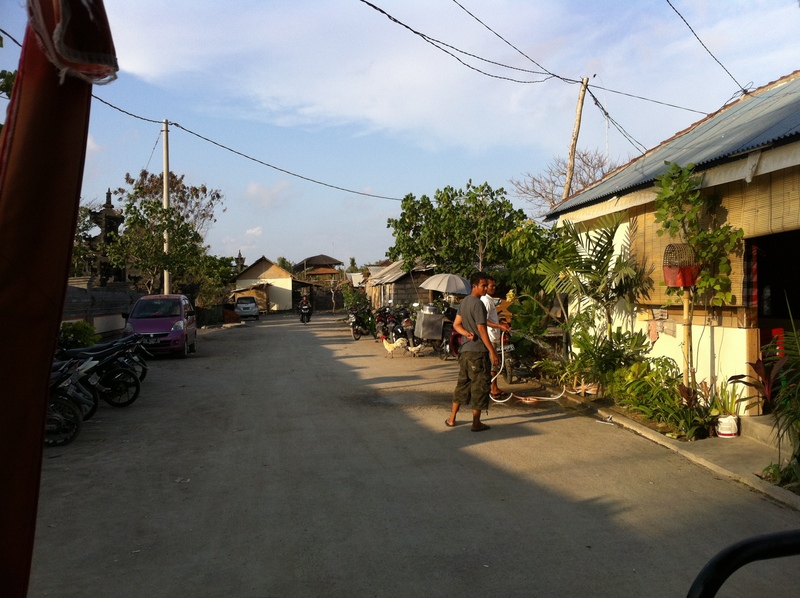 There are narrow sidewalks, in very bad disrepair, that are at least not in the middle of it all. 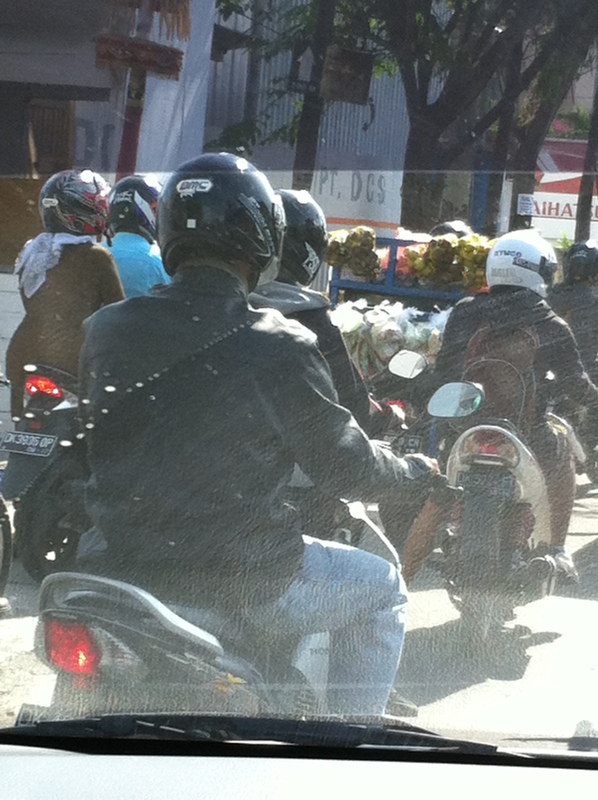 To get across, a pedestrian must raise a hand and wait for the traffic to stop; the motorbikes rarely stop unless they are behind larger traffic that forces them to do so. We shopped in the delightful but, again, overzealously-manned shops and bought a mediocre dinner at a local take-away before returning to our room. Next day, more of the same. 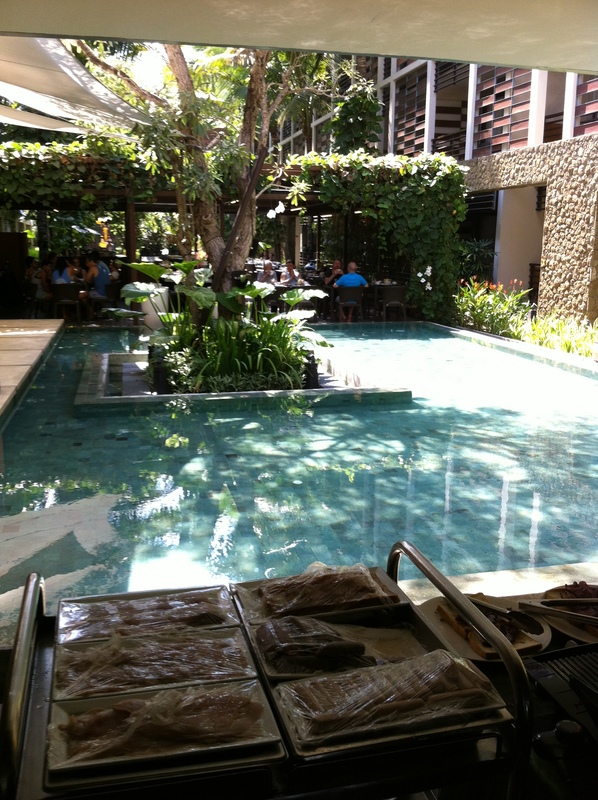 Breakfast, which is included as it was at Belhotel, is an elegant affair, and the food is sumptuous, well-presented. But don’t try to take food out to your room; as with the previous hotel, staff is obliged to do the “work” for you. The food here was actually the best we had in Bali. None of the restaurants — and we tried various levels of price — in the five days we were there was better than okay, and in Seminyak, the food we had was overall atrocious. Tasteless, greasy, without distinction; everything we tried (we were really trying to get to know the local food) was no better than blah. On our last night in Bali, the dinner we had — after much consideration and walking around looking at possibilities, we ordered from the hotel restaurant — was downright awful. The coup de grace happened at the airport. 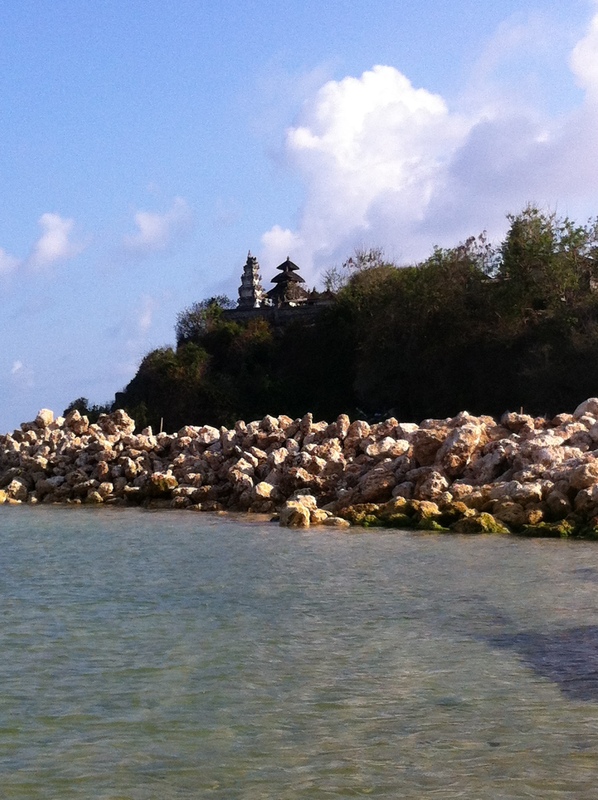 Coming into Bali, we had been told that we should have with us $25 US per person to buy our visas. But no one told us that on our exit from the country we would need to pay an airport tax just to get in to our gate. The most disheartening aspect of this was that the tax was levied in local Rupiyah and would have been the equivalent of about $15 apiece. We had already converted our money to Baht for the return to Thailand, which, the official told us, was perfectly acceptable. Of course, we paid double for our misstep; in Baht, we paid the equivalent of $30 each!